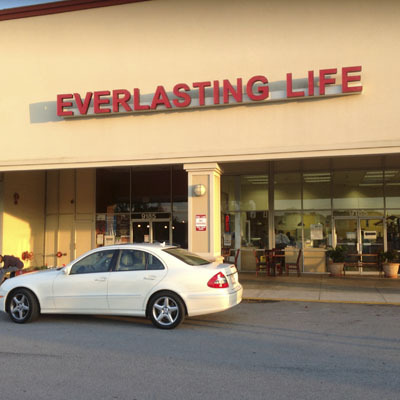 The first time we visited Everlasting Life, we had a little trouble finding it. We stopped and asked some guys in the neighborhood and they all exclaimed in unison, “Oh, that’s a great place to eat!” We tried it and had to agree. The mac and cheese was the best vegan mac and cheese I’ve eaten to date. The portions are huge! I had sweet potatoes with brown sugar, collard greens and mac and cheese as my entree. 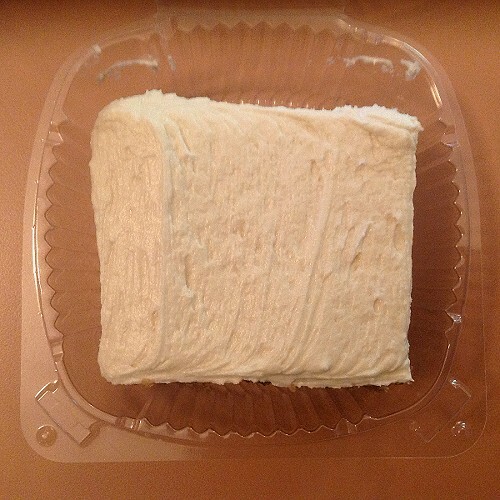 I will admit, I also slipped in a piece of vegan zucchini cake and I would not let Rich have more than one bite. It was that good! 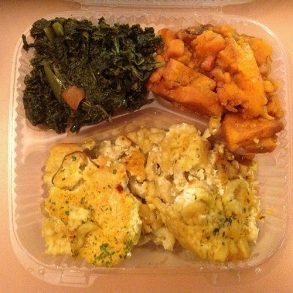 Southern soul food made healthy is my best description for it. Every day the menu changes. 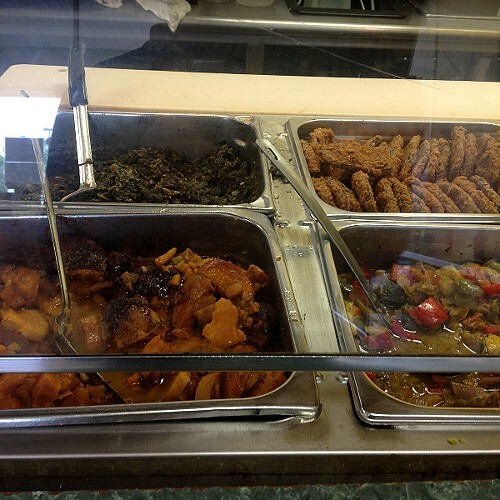 The hot bar offers one entree and two sides for $11.00 or one entree and one side for $8.75. 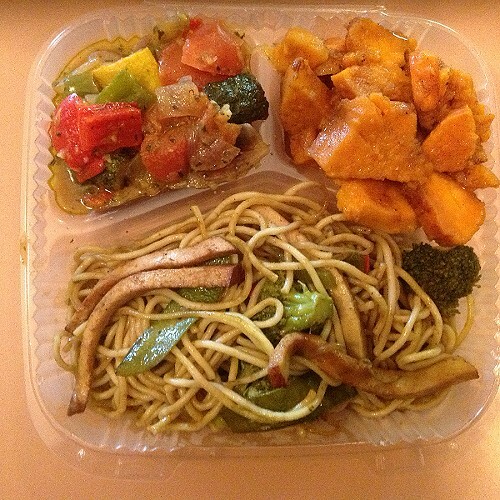 You may choose to have only the vegetable sides or only entrees, the price is dependent on how many you choose. The cold bar offers a huge assortment of salads. A plate of two salad dishes is $7.00, three is $10.05 and four is $11.75. You may also purchase personal pizzas, sandwiches, breakfast rolls and much more. 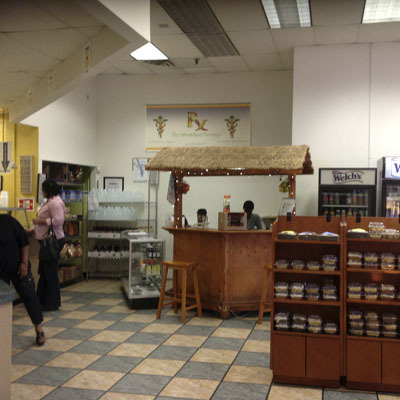 The owner, Dr. Baruch Benu, (known as Dr. Baruch) began this restaurant with the idea that one should not have to leave one’s own neighborhood to find something healthy to eat. 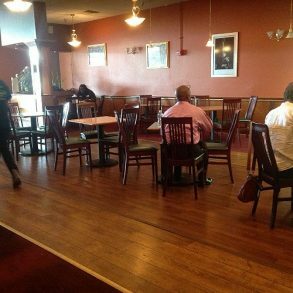 He looked around and realized there were only unhealthy restaurants serving his largely African American community. He remembered hearing someone say at a food conference, “When you control a man’s food, you control him.” That was the impetus for his first restaurant,which began in his garage and finally became Everlasting Life Café, located on Georgia Avenue in DC. Now he has also opened Everlasting Life Restaurant and Lounge in Capital Heights, MD. Education is a large part of Baruch’s mission. Not only does he want his community to be able to eat healthy foods that taste good but he wants them to understand why this kind of food is superior to any other kind. There is a large dining area where you can take your food and enjoy your meal while watching a television screen broadcasting any number of educational videos such as Forks Over Knives or Genetic Roulette. He holds workshops and fitness classes as well as educational programs for children. Dr. Baruch believes education is key to understanding health. He sees customers come in day after day. He sees them notice with surprise as they begin to lose weight, they have more energy or need less medications. 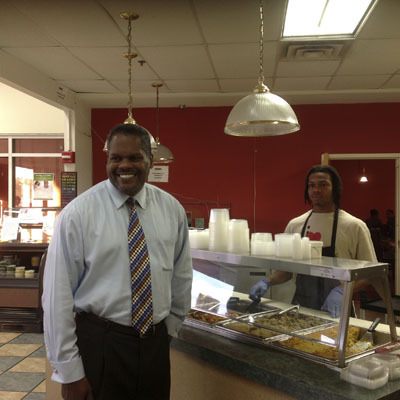 By offering simple, delicious and healthy food he is making a remarkable impact on his community. Baruch believes we have to eat the cure. “It isn’t about marching for the cure, or telethoning for the cure. It’s about eating the cure.” I think he’s on to something big! I was at Everlsting 01/06/16 as advised by a secretary at my doctors office. She gave me some advice about my eating habits and health that she was also having and told me she had given up meats completely. She said to try Everlasting, so I did. The variety of food was amazing to see. I didn’t know how vegan food would taste. I tried the shepherd pie, meatloaf, carrot salad, broccoli & califlower salad, olive salad and chicken salad- all vegan. 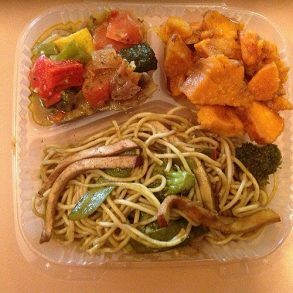 I was so surprised that all the food was excellent in taste.I had enough to eat on for several days and the food was still great in taste. I noticed that my body was feeling better and not bloated after eating. I am doing a vegan and fruit fast, so this came right on time. So far, the foods was seasoned, the texture was filling and I couldn’t believe it was all vegan. This will be the place for me now to help improve my eating habits. At the end of the week, I do feel my better and definately not eating as much as I was before. Everlasting will definately be the place for me. If you haven’t tried them, go atleast once. I think you’ll be hooked like me. I’m doing this to better my health as well as to loose some weight. With GOD and Everlasting Life Vegan, I know I can do this.